The first card I painted for publication was sometime in the mid-to-late 1970s, long before collectible card games like Magic: the Gathering were a twinkle is someone’s eye. Bruce Pelz saw something he liked in the fannish art I was showing at regional fan conventions, and asked me to contribute to the Fantasy Showcase Tarot Deck. It took him eleven years to put the deck together, and it remains a unique bit of fannish history that I’m strangely proud to be part of. It was the mid-90s that saw the explosion of collectible card games, with the rise of Magic: the Gathering and the many related games that followed soon after. Although I had been working in the game industry for a good fifteen years before the first deck of Magic rolled off the presses, the enormous popularity and originality of the game changed the industry. I was somewhat recognized for the work I had done prior to the rise of the card games, but no one would line up around the building for my autograph until after I joined the legions of talented, capable artists put to work painting hundreds if not thousands (tens of thousands?) of individual works for the publishers to put on their cards. 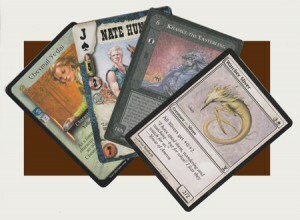 I will be at GenCon next week in Indianapolis, and I am happy to sign cards for people. If it wasn’t for the players who cared enough to buy the game in the first place, I (and many others) would have had much less reason to paint as much as we did. I am grateful for the chance to have done so much and the best way I can say Thank You is by making myself available to sign cards for you at conventions like this. You will be able to find me at the Namaste Entertainment (Booth 1643) or at Flying Buffalo (Booth 501 … not 810 as I posted initially!). This entry was posted on Friday, July 29th, 2011 at 9:10 pm	and is filed under Art, Creativity, Gaming, Site. You can follow any responses to this entry through the RSS 2.0 feed. Both comments and pings are currently closed. I’m a bit unclear if the last one is the one you’re looking for or not. It has the Balrog on the bridge, but Gandalf isn’t very much in evidence. Sorry, but I don’t have the ‘host’ box from the Balrog expansion, so can’t check those. Thank you, Charles! I forgot about “Remains of Thangorodrim” but I do remember it. I think you ALSO spotted another I’d forgotten about — “Darkness Wielded” has the Balrog on an arch of the bridge as I recall and, as you say, Gandalf nowhere to be seen. However, there is another card that does have the two of them, although Gandalf is hardly in iconic guise. You’re seeing him from behind, his robes in tatters, in battle with the Balrog — that is the one I remember (having the original art still at home). The mention of ‘stormy looking’ on the updated blog entry rang a bell. I think you did the art for a card in the other [‘Balrog’s Host’] box in the Balrog expansion called ‘Crowned with Storm’. Now that I find particularly interesting, Charles: I never did a collaboration with B. Churashev, nor had any card named By the Ringwraithâ€™s Word. Looking it up online, that image is not mine. I wonder where the mixup comes from. As for Shelob, the sites that reference my name with that card do not have images, which makes me suspect they’re cribbing each other’s lists and someone got it wrong originally. Without the image to compare, the inaccuracy is being continued. And no, I didn’t do a Shelob.